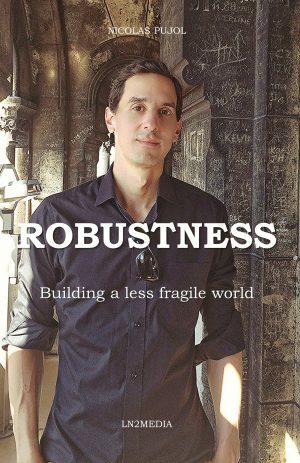 When you are pressed for time, have hungry kids, and want to make something at home, there is a sense that something may have to give. Yet, the more I see my kids grow, the easier they become in liking a variety of flavors, including those which are plant-based and in this case, devoid of added fats. 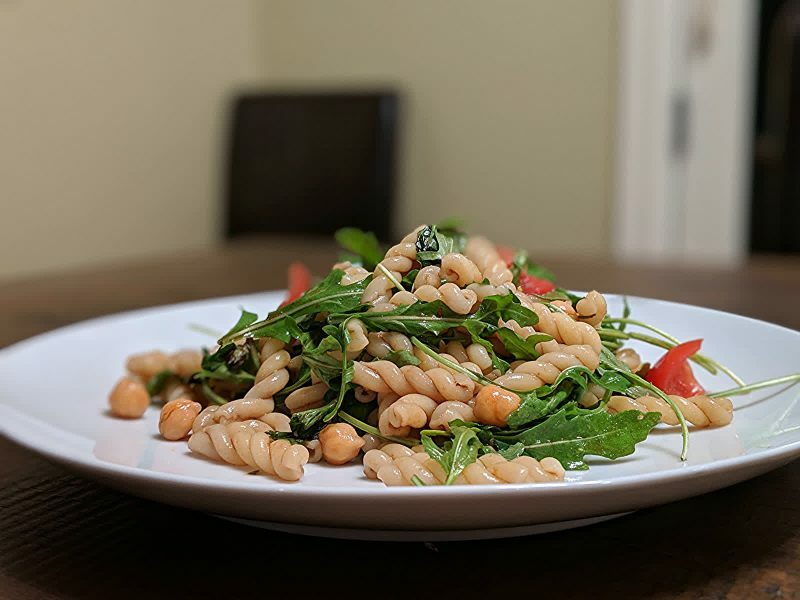 This oil-free pasta salad with arugula, tomato and garbanzo beans lasted us two meals for the three of us, and we had plenty to eat on our plates each time. 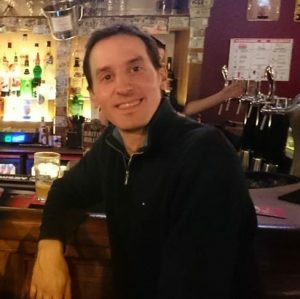 Making pastas was straightforward – I only avoided using spaghetti, which would have been longer and needed the use of a knife. 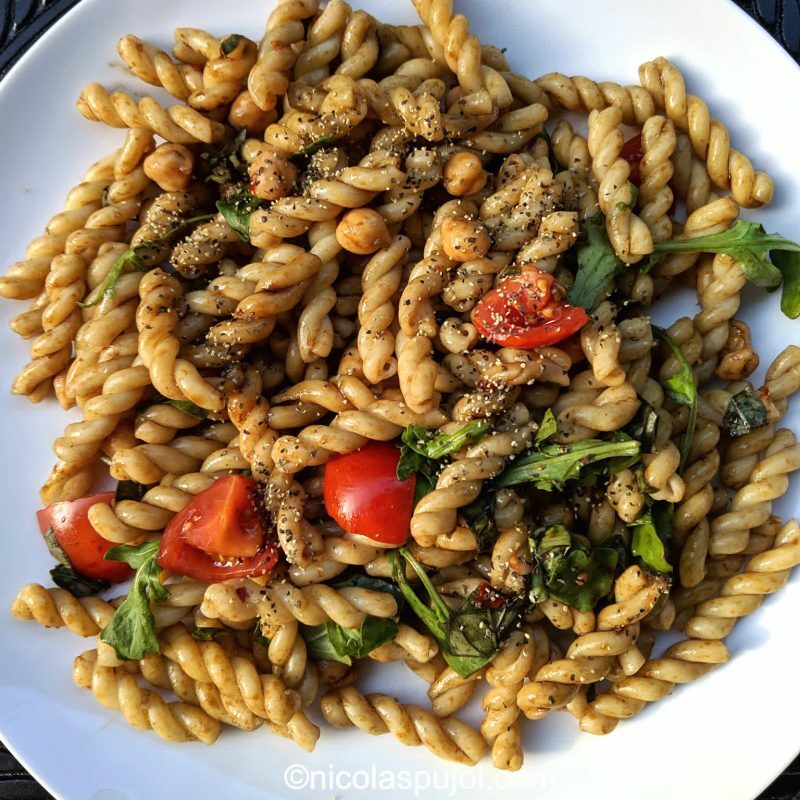 With shorter pasta shapes, you can pick the ones you like the most. I let them cool down after straining by pouring a bit of cold water on top, so that they would not burn the veggies. 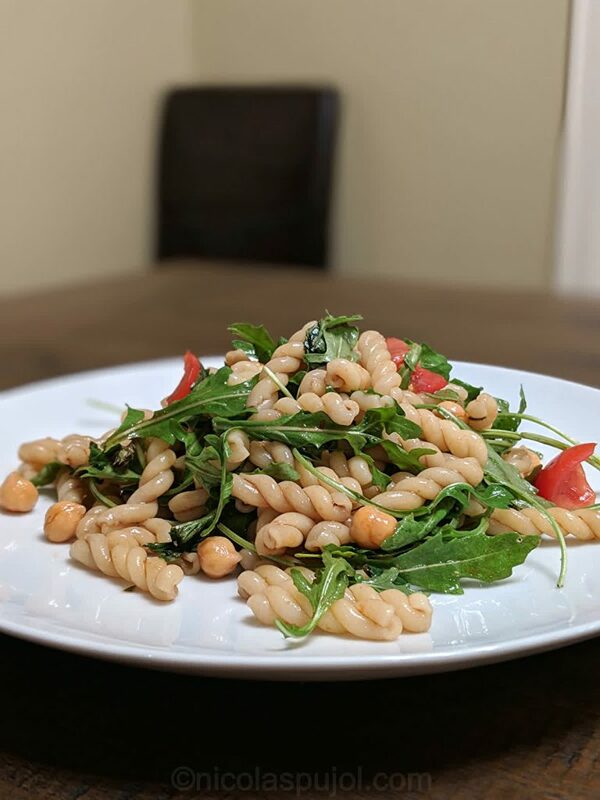 Arugula and tomato added to the refreshing side of the dish, while the garbanzo beans provided extra complex carbs to complement the pastas, plus plant-based proteins. Did you know beans are a significant source of protein in the plant family? With these, I added an oil-free spicy balsamic vinegar basil dressing. The result is very tasty, a little bit acid given the arugula by itself is already tart, we are adding a vinaigrette sauce, and not using any oil. Yet, this dish was super easy to digest, because independent of taste, the ingredients are highly digestible. 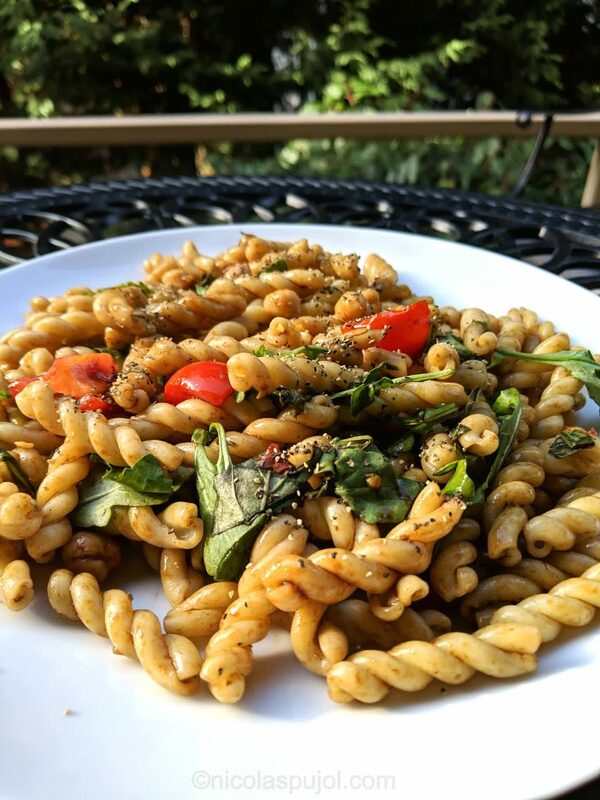 Of course, you must be OK with gluten, and if not, feel free to substitute the regular pastas with gluten-free alternatives. It’s impressive how many new choices exist nowadays for gluten-free pasta when visiting a grocery store. 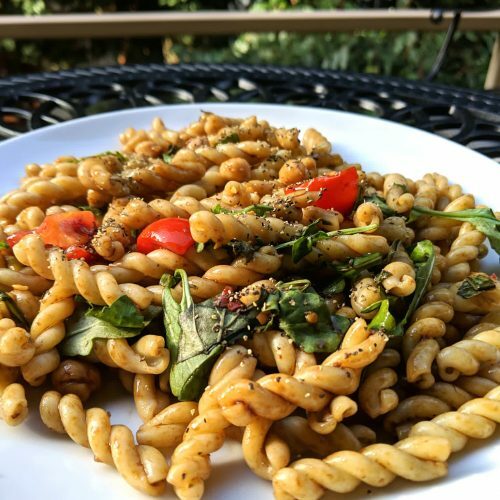 This oil-free pasta salad with arugula, tomato and garbanzo beans recipe is easy to make and uses a spicy balsamic vinegar basil dressing. Boil and cook the pasta for the required time. In the meantime, prepare the oil-free spicy balsamic vinegar basil dressing. 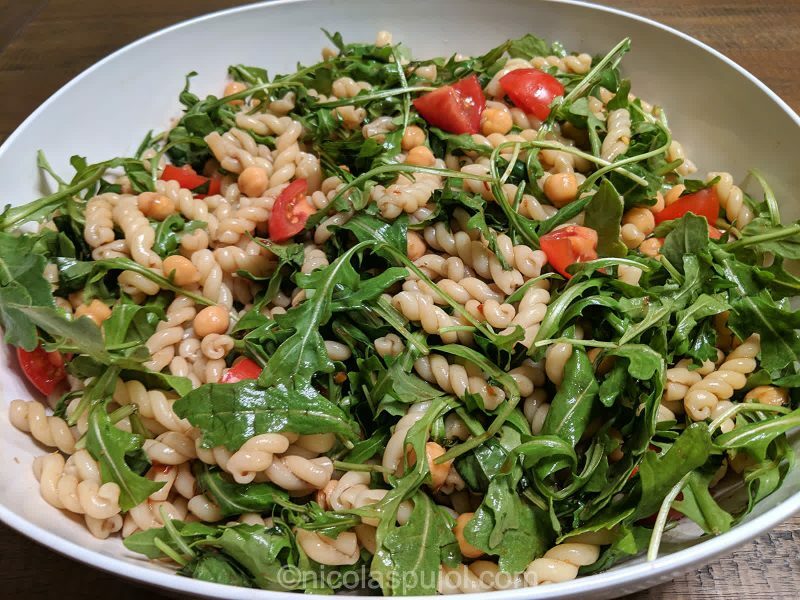 Cut the tomatoes, open the garbanzo beans and strain them, add both plus the arugula in a large salad bowl. Strain and cool down the pasta by running cold water over them while in the strainer. Let the water finish dripping away for about one minute. Add the pasta on top of beans and veggies, then add the sauce, and mix everything. Serve immediately, or you can refrigerate it for up to 2 days. It goes well immediately served or later on, as the sauce penetrates more of the ingredients. Stir well before serving.